I haven’t blogged in a while. It’s not that I don’t have things to say that I hope others will read, it’s just that my bank of time seems to be overdrawn these days. Life interrupts, eh? I made a tough decision earlier this year between the two retreats I speak of in this blog. The decision was, for now, to withdraw from my master’s program in ministry. I hope to resume one year from now, but we will see what life throws at me in the interim…travel to Syria in February, to Lebanon in August, Jana’s medical needs, family. You all have a similar list; the blanks may be filled in differently, but that is life. Over the last three summers plus two weeks online in the fall I have had what has been the most fulfilling and filling class: The History of Christian Spirituality, taught by Dr. Wendy M. Wright. You should look her up and buy her books! You will be most blessed. From the beginning, people who have been called to follow the way of Jesus have expressed their understanding of him through traditions of spirituality. Just how has that wild goose of a Holy Spirit manifested to them how to experience and share the love of God in Christ…that is spirituality, at least as I understand it. 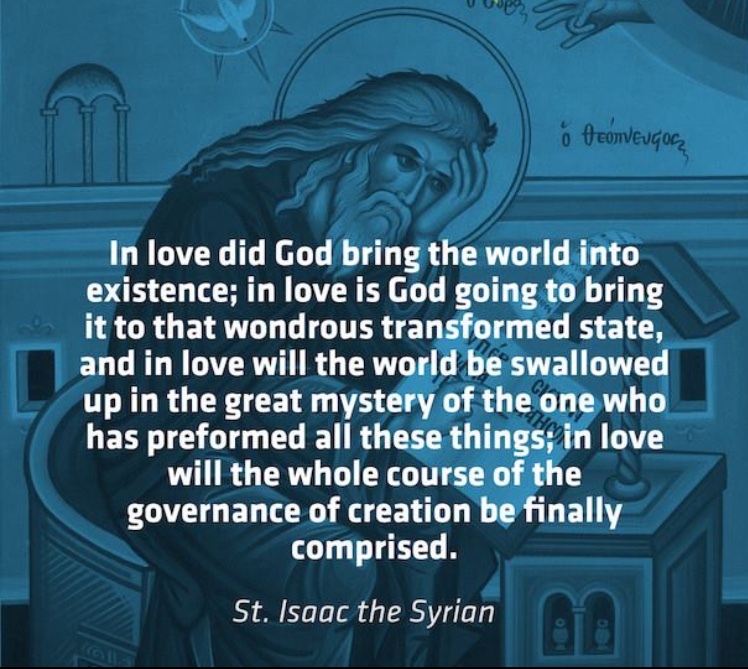 The trajectory from the beginning has been, as St. Isaac the Syrian says, love. That is what I have learned from the martyrs and monks, the mendicants and mystics, and finally in part three, the early modern disciples who carried on in reformation times. Throughout this course of study I have written two previous papers. The readings I did, the voices I heard, all had prominent connections for me in this age with those I have journeyed with in Lebanon, Syria and Iraq. Throughout my class discussions and in those papers I have used example after example to illustrate how these streams of spirituality still flow in God’s saints walking the earth today. This third class was different, and even more personal as I connected these stories with my life with my sister Jana. Here then is my final paper. I write it in honor of and in gratitude to Jana whose life has modeled mercy, charity, love, light, faith and hope for me. Footnotes, bibliography and all, I hope you find a blessing in it. I begin my reflection on the back page of one of our texts that came with me to our cohort’s silent retreat following our day of class on June 16, 2018. I was struck by a group of people I had never heard of, and this quote drew me in. 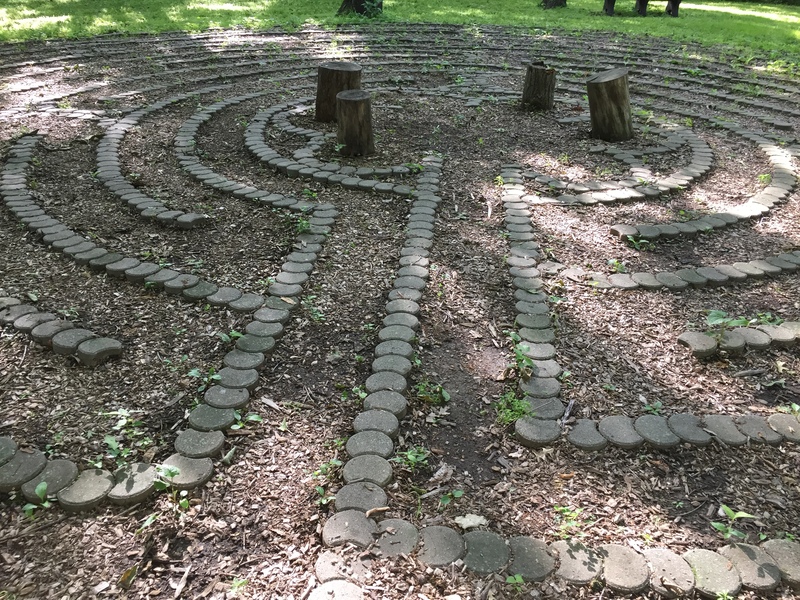 As I walked the labyrinth at Griswold, I had a sense that some how God’s heart was in the middle of its twists and turns, and the only way for me to find God’s heart was to keep walking until I got to the center. It was so frustrating! I would get so close and then a twist would take me all the way to the outer ring, as far from the center as I could be. “Oh Lord,” I prayed as continued walking, “why is my pitiful human heart so far from yours? Why can’t you just grab mine right now and fuse it to yours?” Upon reaching the middle and calming down, I was struck by the realization that God had been with me the whole time. His heart was not in the middle of the labyrinth, but had been guiding me the whole way, enabling me to joyfully walk back out. 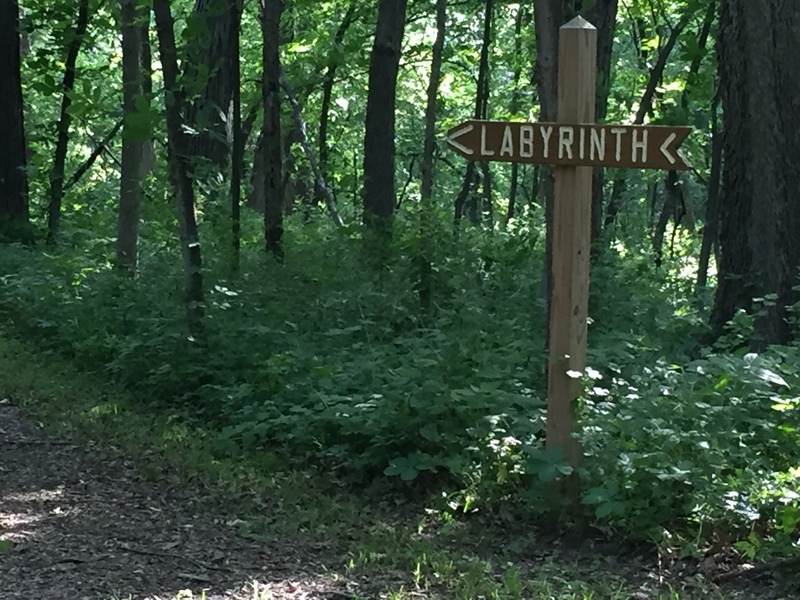 Labyrinth, Creighton Retreat Center, Griswold, Iowa, June, 2018. There is much to reflect on in this final section of the history of Christian spirituality, and I cannot do any of it justice, so I will restrict my reflection to what has captured my attention in the weeks of reading and the weeks since where life has intersected with our assignments. I know there is much more to reflect on the protestant traditions – I could do a whole reflection just on the beautiful poetry and hymns and the piety they portray – but what really moved me in this class were the Catholic traditions, beginning with the Carmelites. The vision statement of my church is to be on the journey with the living Christ, and that is the language that struck me in the story of the Carmelites. Their journey is modeled on Elijah, “a man on a journey, always on the way from ‘here’ to ‘there’ in response to God’s call…” Scripture tells us that God calls Elijah to the Wadi Cherith, to drink from the stream. (I Kings 17:2-7) Cherith means love: God quenches our thirst with his love. This love transforms us as we are drenched in the presence of God. Out of this tradition of the Carmelites come people like Teresa of Avila. A reformer of her order, she also spoke of a journey and left writings (such as The Way of Perfection,) behind to help us take that inner journey with God. “For Teresa the inner journey is one where the love and mercy of God transform her. However, she does this while being very conscious that the way forward is to allow her humanity to be transformed and linked to the humanity of Christ.” “Friendship with God and entry into the life of the Trinity is the end of the journey…Again it is the humanity of Christ as found in the Gospels that is the way for Teresa. Christ is the teacher and the ‘Our Father’ is the great prayer that he gives us.” As I shared in one of my discussion posts, that prayer has been often prayed and contemplated in my sixty years of life. To share it with Teresa as a guidepost on the journey is a gift. 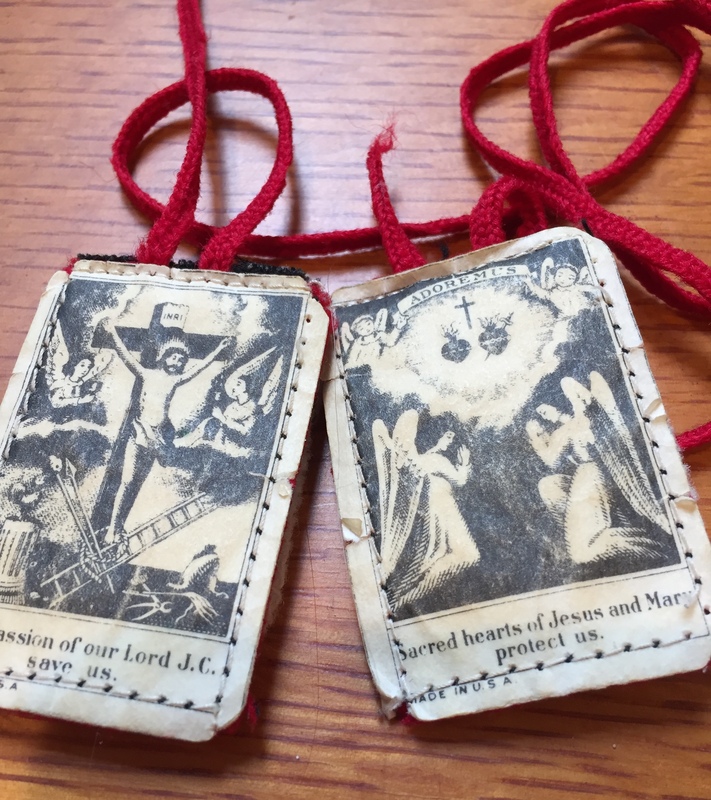 First communion scapular from 1966. Finally, I want to touch on Vincent de Paul. The story we heard of Vincent de Paul in the Creighton podcast brought me back again to the Matthew 25 story I mentioned earlier. As I noted while listening, “Assigned to a rural parish, he fell in love with the poor and his ministry to them.” He “fell in love” with the poor and experienced the “privileged presence of grace, the poor as masters and teachers…he turned the medal over and saw the face of Jesus.” This to me is a continuation of that idea of joining the human and divine hearts, and this is an expression of grace that moves me to tears. I believe that to see the face of God in those around us is exactly what God calls us to. This is the heart of the gospel: to love God and to love our neighbor as ourself. We cannot love God without loving neighbor, and we cannot love neighbor unless we see God on the other side of that medal! This has been a rich and deep study of many traditions, and it happened too quickly. As the expression goes, it was like drinking from a firehose! But as I stated at the beginning of my reflection, life in the present day intersected with my reading and my pondering. One week after I began with a whole day of class followed by a silent retreat where I read the back cover of Heart to Heart, I found myself at yet another silent retreat. This one was directed by two women of my own church and was held at the Benedictine Center in Schuyler, Nebraska. I went with my afore-mentioned sister Jana. She is handicapped from a car/train collision in 1983, which occurred on her way home from a Bible study. Just as at Griswold, there is a labyrinth in Schuyler. I really wanted Jana to experience the journey of the walk in, and the inner journey that is part of it. Unfortunately, Jana cannot walk rough ground by herself, and the wheelchair we used for longer distances was no help either. And so we parked it, and made our way slowly through the deep grass until we arrived. Holding up together, St. Benedict Center, Schuyler, Nebraska, June, 2018. 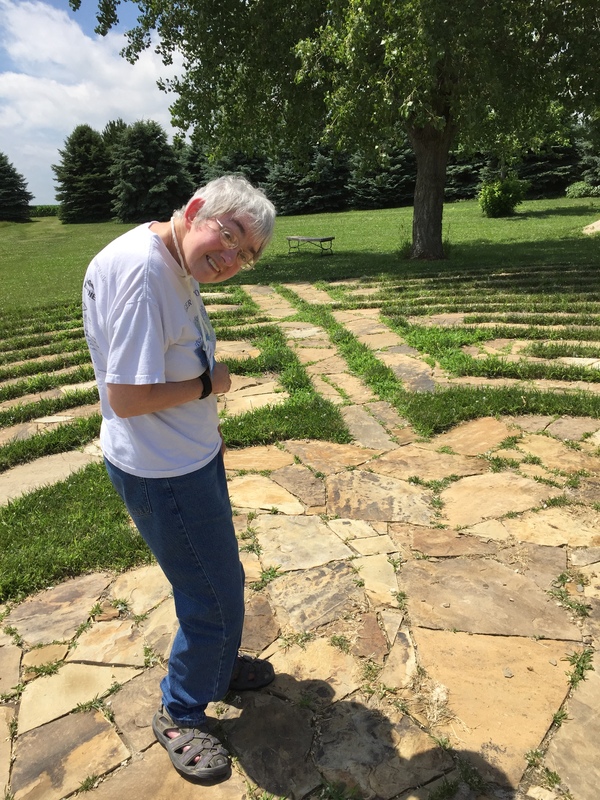 In the middle of the Labyrinth, St. Benedict Center, Schuyler, Nebr., June, 2018. Being proud of my revelation from the week before, I was convicted once again that not only my Christology, but the way I experience God was still being refined. My revelation was that not only was Jesus, Emmanuel, God-with-us, is always there, but that indeed for me personally he has been speaking to me, caring for me, loving me up close through the broken body of my sister for the past thirty-five years. I may have been holding her up through the labyrinth, but she has held me up through life, inviting me back into the community of the church. When I flip the medal of Jana’s face over, there is Jesus. When my body aches from holding her up, that is the privileged presence of grace. When we have walked the halls of Congress advocating for the poor around the world with Bread For the World, we are living Jesus. On that dark night in 1983 when she was struck, “thy will be done” became more than just a line in the Our Father to be repeated unthinkingly every night. Thy will be done is what you pray as you journey with the living Christ on a pilgrimage to join your heart with his in the dance that partners humanity and divinity. Through thirty-five years of sharing her heart with me in words and deeds, three streams of mercy, charity, love and light have flowed from her like living streams. And as the mark of divine visitation is transformation, in the course of this most ordinary event of a cousins’ reunion, the two women are transformed. They are transformed as the world is transformed by the action of God’s love. In their heart to heart meeting these women are the images of both the individual and communal life inspired by the Spirit of love…The kingdom of God, the reign of divine love, is thus in Salesian spirituality aptly named as a visitation – a union of divine and human love, a love most vividly realized on earth as spiritual friendship. 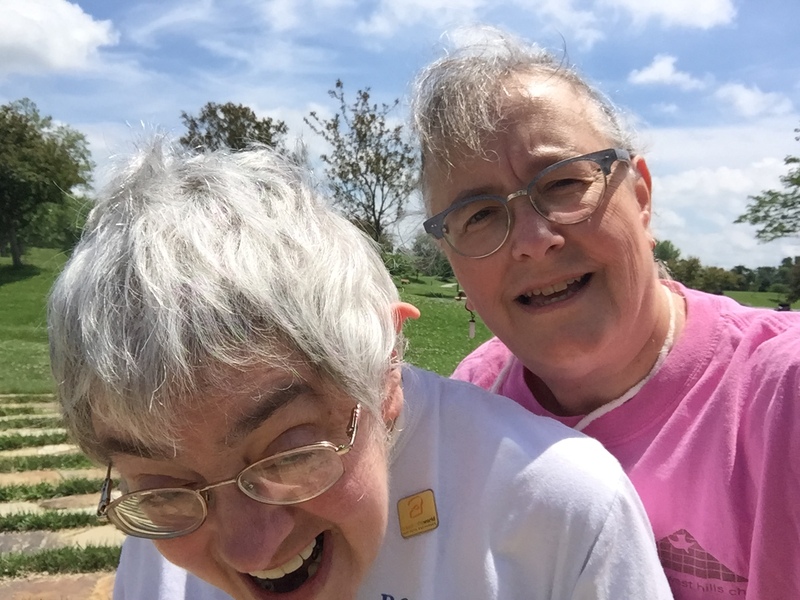 Some people might have looked at us that day at the labyrinth and thought, “Isn’t that nice…one woman holding up another so she can walk the labyrinth?” What they did not comprehend was that Jana was holding me up through this journey. Human love and divine love, joined in a spiritual friendship. And that has made all the difference for us both. McGreal, Wilfrid. At the Fountain of Elijah: The Carmelite Tradition. Maryknoll, NY: Orbis Books, 1999. Raitt, Jill. “European Reformations of Christian Spirituality.” In The Blackwell Companion to Christian Spirituality, edited by Arthur Holder, 122-138. Oxford, UK: Wiley-Blackwell, 2010. Wright, Wendy M. Heart Speaks to Heart: The Salesian Tradition. Maryknoll, NY: Orbis Books, 2004. Wright, Wendy M. MAM769C Lecture notes, June 16, 2018. Wright, Wendy M. “St. Vincent De Paul.” Catholic Comments Podcast, 22 Sept. 2014, cucatholicctr.org/2014/09/st-vincent-de-paul/. Wendy M. Wright, Heart Speaks to Heart: The Salesian Tradition (Maryknoll, NY: Orbis Books, 2004), Back cover. MAM769C lecture notes, June 16, 2018. Wilfrid McGreal, At the Fountain of Elijah: The Carmelite Tradition (Maryknoll, NY: Orbis Books, 1999), 38. Lecture notes, June 16, 2018. Wendy M. Wright. “St. Vincent De Paul.” Catholic Comments Podcast, 22 Sept. 2014, cucatholicctr.org/2014/09/st-vincent-de-paul/. And just as she holds you up, you hold me up. We all do it together and I am so grateful for the bunch of us!